Today, when you order "Duct Tape Blindfold by Kenton Knepper - DVD", you'll instantly be emailed a Penguin Magic gift certificate. You can spend it on anything you like at Penguin, just like cash. Just complete your order as normal, and within seconds you'll get an email with your gift certificate. Kenton's own unique Duct Tape Blindfold Method fully revealed at last! Kenton's incredible Blindfolded Three Card Discovery with three free selections, found while blindfolded ! Kenton's unique blindfold method uses legitimate gaffer's or duct tape. This tape is universally acknowledged as the strongest tape known to man. This can be performed entirely impromptu. No preparation of the tape. The performer can act as if legitimately blindfolded because the performer actually cannot see... until desired. The performer can be blind or see in an instant, at any time, without touching the blindfold at all. This blindfold is as real as it gets! The audience will wince and some nearly faint as the performer slowly removes the duct tape blindfold from his eyes. There is no doubt in anyone's mind that it would be impossible to see. NO Seeing through the tape. *Unlimited routines and effects will come to you once you learn Kenton's secrets with his original Blindfold creation. Unlike other versions, the performer can look straight down to the ground and Kenton's Blindfold will still allow the performer to see writing, people and more easily. It's all very simple and direct - the sort of devious solution you would expect from Kenton. Note: While this special blindfold has endless applications it is not suggested for use in a blindfold drive. Kenton's 3 Card Blindfold Location routine is tipped in its entirety for the first time ever. This routine and original method has blown pros away for years. Kenton's secret was mentioned only in part previously, causing a slew of supposed creations and imitations by others who did not know the true secret. The result was inferior gimmicks and difficult moves never needed in Kenton's original work. 3 freely selected cards are shuffled into the deck, while the performer is legitimately blindfolded. The performer truly cannot see. The deck is actually shuffled and cut - NO false shuffles, finger breaks, etc. Still... 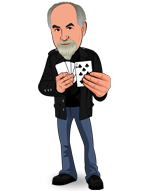 The performer finds all three cards, handing each to the proper person WHILE BLINDFOLDED, even causing one card to change to another's spectator's card in their own hands, while the original card ends up in the performer's pocket... all while legitimately BLINDFOLDED... and with no palming required! This is pure Kenton. You can even name a card during the revelations, although no card is forced and you really cannot see the card. Yes, there is a gimmick, but it is easily made and Kenton's original method will clean up loads of other card work and card gimmicks you have purchased from others too. Combine this with Kenton's Blindfold and you can hand the correct cards to people in a row who mix themselves around freely too. Get Kenton's ORIGINAL method and see for yourself why all other imitations never could come close. Remember: This 3 Card Blindfolded Location is in addition to the explanation of Kenton's Original Duct Tape Blindfold method. You get the full work on BOTH the 3 Card Blindfold Routine AND Kenton's Original Blindfold Method on this one DVD. Performers, amateurs, mentalists and magicians alike have been floored by these presentations. When they learn the inside work, they are even more impressed with the direct, simple and practical solutions Kenton has created. How strong is just the mere suggestion of duct tape as true security in real life? The U.S. Government issued the suggestion of using DUCT TAPE to tape up doorways to be safe and secure from a chemical attack! Question. Besides The Force from Star Wars, what has a light side and a dark side and holds the Universe together? Answer? Duct tape! From a science store: "Nuclear physicists speak of five fundamental forces: weak, strong, electromagnetic, gravity, and duct tape." These sorts of comments from daily life are in the back of the minds of audiences, continually suggesting that duct tape is the most secure material well-known and familiar to us. Imagine then how much more power there is in a blindfold of duct tape versus a cloth blindfold or unnatural metal one! Kenton has taken assumptions and suggestion and made them his favorite blindfold. We think it will be one of your all-time favorites too. This devious secret is simple and easy to perform. The power and believability of it however is beyond compare. THE PERFECT AND BELIEVABLE SOLUTION FOR REALISTIC MENTALISM WITH BLINDFOLDS AT LAST. This is a solid blindfolding technique but the possibilities for it are very limited. Nothing that Kenton Knepper taught is even mildly usable in my show, but the actual method of the blindfold just might prove useful in a few years, who knows? This is the kind of thing that I will watch, learn, then it will sit on a shelf for a long long time, until it maybe finds its place. Kneeper definatly thinks outside the box! The secrets behind this are devilishly deceptive. This effect is best when presanted in a light-hearted way. It leaves room for you to sprinke some jokes during the routine aswell as it is strong enough to be a closing trick. Great for Magicians aswell as mentalists.